Using a five-point scale, where 5 means strongly agree and 1 means strongly disagree, please indicate your level of agreement with the following statement: Online courses can achieve student learning outcomes that are at least equivalent to those of in-person courses. Using a five-point scale, where 5 means strongly agree and 1 means strongly disagree, please indicate your level of agreement with the following statement: I love teaching online. 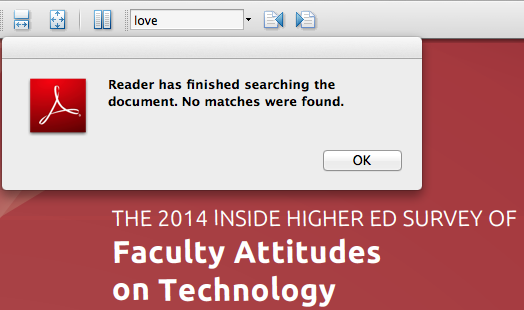 There are not any questions about the love of teaching anywhere in this Inside Higher Ed survey; I even used Adobe Reader just to check and make sure: no love there, as you can see. Yet it seems to me that asking people what they love about teaching is a very important question. So, here are my Top Ten Reasons Why I Love Teaching Online. I’ll do the Top-Ten list backwards, Letterman-style. Meanwhile, if you are curious about the specific classes I teach, I’ve provided that background information at the bottom of the post. I love teaching 40 hours per week. Teaching online is my full-time job, and I am in my office 9–5, Monday through Friday. I don’t interact with students during evenings or weekends (except for emergencies, of course), but I am ready, eager, and available to connect anytime during the work week. Since we can connect synchronously (I respond to email promptly, and Twitter also provides instant chat) or asynchronously (via email and blog comments), the lines of communication are always open. Back when I taught in a classroom, the intensity and importance of every minute of class time was very stressful for me, and I often forgot many things that I wanted to say; sure, there was a fun adrenaline rush when class went really well, but I don’t miss it. The quantity and quality of my communication with the students is much better now that I teach online full-time. I love using the Internet as our classroom. Traditional college classrooms always felt so empty to me: no books! no art! no music! Just… empty. Online, though, I can create rich cultural spaces for my students to explore at any time; the building is always open. In the course materials I prepare, in the daily announcements, and in our Twitter stream, I can include all kinds of free books to read, along with art, music, videos, whatever I can find online that will enrich the topics of the course. Likewise, I love helping my students learn how to use digital publishing tools so that they can create their own Internet spaces. Yet here we are in 2014, and most of my students have never created a website of their own, and only a small minority of them have ever blogged. Luckily for me, they are amazed and delighted to find out how easy it is to start publishing online! I love watching the students’ blogs and websites grow. Although some people refer to learning management systems as “walled gardens,” I’m not persuaded that much can grow in the closed environment of the LMS (we use D2L at my school). So, I minimize my use of the LMS and focus instead on student blogs and websites, which really do feel like gardens that grow! We start out with a big plot of dirt, the rich and fertile soil of the Internet. Students stake out their blogs, and posts start sprouting. Then they stake out their websites, and webpages begin to bloom. All semester long we tend our gardens: pruning, fertilizing, weeding, with each student’s garden different from any other. In an online class, it’s easy for each student to have their own “space” like this, a space for creation and growth, and the most important part of my classes consists of the students visiting these spaces, sharing their creative growth with one another. I love having a focus on the written word. For all that the academic enterprise is built on the written word (publish or perish! ), there is a mismatch with the highly oral nature of the classroom, an anachronistic holdover from the days when printed learning material was scarce. Much classroom time is still devoted to listening, with available discussion time badly constrained by the clock. Reading and writing, meanwhile, take place “outside” of class, not fully integrated into the activity of the classroom. Online, though, the written word is the medium for pretty much everything we do, so my classes are naturally writing-intensive. For students who need a supportive environment in which to improve their writing skills and become more confident as writers, an online class can work wonders. I love to type. Yes, I type very fast, which means I can respond quickly to emails, provide abundant written feedback to students, and also create enormous quantities of online content in the limited time available. Compare the effects of limited time of the classroom: because I knew the clock was ticking, I would tend to speak very quickly, even too quickly. Students would tease me about talking too fast, but it was actually a serious problem. Talking too fast is not good, but typing fast has proven to be very useful for me, and the fact that I honestly do love to type is an important factor in my success and satisfaction as an online instructor. I love the way we can all work at our own pace online. Even though I type fast, I like to think slowly, and my students also need the time to stop and think, working at their own pace. The fact that we are not ruled by the clock (50 minutes! hurry up!) means that we can take our time, reflect, and even let our thoughts wander back in time. As blog posts accumulate, you can return to them later, looking back on what you were thinking and then re-think those old thoughts, picking up where you left off. When I taught in the classroom, I would often struggle to remember just what we had talked about in a previous class. But with the digital trail that online learning naturally leaves behind, it’s easy for both the students and for me to retrace our steps, reflect, and re-think. I love NOT being at the front of the classroom. When I taught in the classroom, I did not have trouble holding my students’ attention; I’ve got lots of enthusiasm and confidence, a sense of humor, all the things you need to make the show go on. At the same time, I never felt like that was the best way for me to help the students learn. 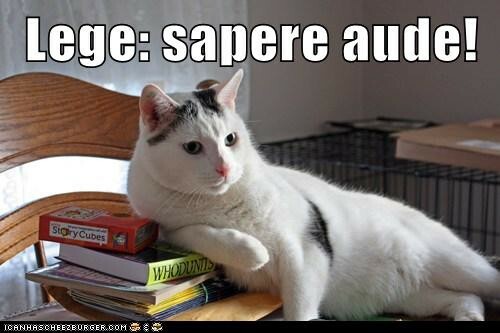 Online, though, I can share my enthusiasms along with my humorous eccentricities (hey, LatinLOLCats! ), while being part of an ensemble cast, sharing the stage with my fabulous students whose creativity goes off in totally different directions, making a richer learning experience for all of us. Instead of just having student presentations as part of the class at the end of the semester, the online environment means student presentations are happening all the time, every day, non-stop, and I get to enjoy and applaud. I love how past students’ work is part of each new class. Each semester has a special quality of its own, and that is especially true for classes where the students’ creative contributions provide much of the class content. So, at the end of every semester, I am sad to say goodbye to the students because I know that no class will ever be quite the same as that class. Luckily, though, the students’ online presence can persist over time, which means I will meet these students again and again in the form of the work they leave behind in the student project archive. I am grateful that almost every student chooses to leave their project online because I would not be able to teach these classes without the students’ abiding presence; their past projects are the single most important asset that I use in my teaching. I love the flexibility of online courses. This is actually two reasons rolled into one: I love the way that the online environment is flexible enough to allow each student to design their own curriculum (see, for example, our UnTextbook with its trillions of possible combinations), and I also love the way that the flexible scheduling of an online course can help students who might be struggling, giving them a chance to recover and keep moving forward even when mishaps occur. I always encourage students to work ahead just in case something unexpected comes up, and I also have an elaborate set of safety nets to help students recover from setbacks. Accommodating individual student interests and needs could get very complicated when the course revolved around the classroom, but an online course offers much more flexibility. I love connecting with every student. Back when I taught in a classroom, there were always some students I did not really connect with — students sitting in the back of the class, pointedly keeping silent (assuming, of course, that they showed up for class); I had no real idea what they were learning, much less what they wanted to learn. Now, online, I have the time and opportunity to connect with every single student, watching them make their own path through the class as they choose what to read, what to write, and what to learn, and I get to know each of them through the accumulation of those choices. Yes, I know some teachers feel a need to look into the eyes of their students to see if they are learning. Not me: I’m near-sighted (I am EXTREMELY near-sighted); I can’t even see into the eyes of students sitting in the front row of a classroom. But reading the students’ blogs and commenting on their projects every week, seeing what they are reading, reading what they are writing, sharing in the news of their lives as they make connections between our class and their worlds… that is what I love most about teaching online. So, Inside Higher Ed, I don’t especially want to answer that question about “at least equivalent student learning outcomes” for online versus in-person classrooms. But if you ever want to ask me why I love teaching online (go on! ask me! ), now you have the answer. Some context: I teach fully online courses for the College of Arts & Sciences Online Course Program at the University of Oklahoma, and I have done so since Fall 2002. As a full-time online instructor, each semester I teach three sections of 25–30 students each, and I have no other job duties. For me, it is the ideal job! The online course program of my college aims to meet the needs of students seeking to fulfill their General Education requirements, so both of the courses I teach are Gen. Ed. Humanities courses: Mythology and Folklore of the World and Epics of Ancient India: Ramayana and Mahabharata. You can find out more here: Anatomy of an Online Course. Teaching online at the University of Oklahoma since 2002!